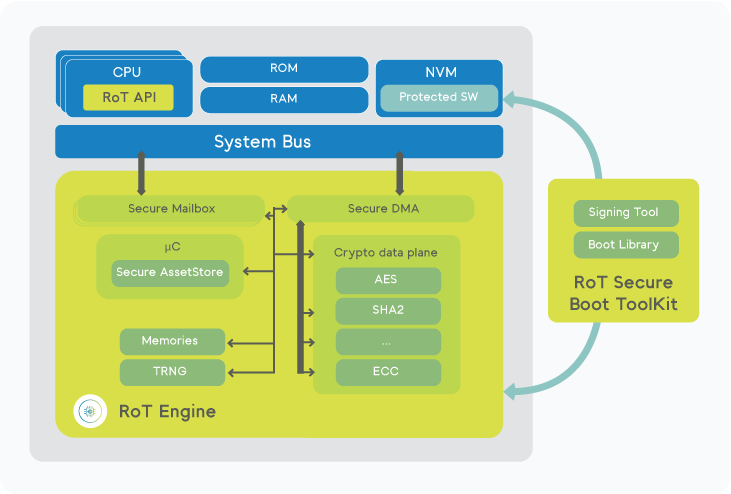 Inside Secure Root-of-Trust Engine, formerly known as Vault-IP,is a Silicon IP developed to protect the SoC platform and its operation so it can securely boot SoCs and protect sensitive key material and assets. At its heart, its Secure Asset Store secretly generates keys and securely store them. Fully featured, its cryptographic data plane associated to its DMA offloads the main CPU while never exposing secret data to the OS or the applications. It is designed to provide secure, energy efficient and accelerated security functions. Highly configurable, silicon proven and FIPS 140-2 ready, the Root-of-Trust Engine is an essential component of Inside Secure Root-of-Trust solutions.